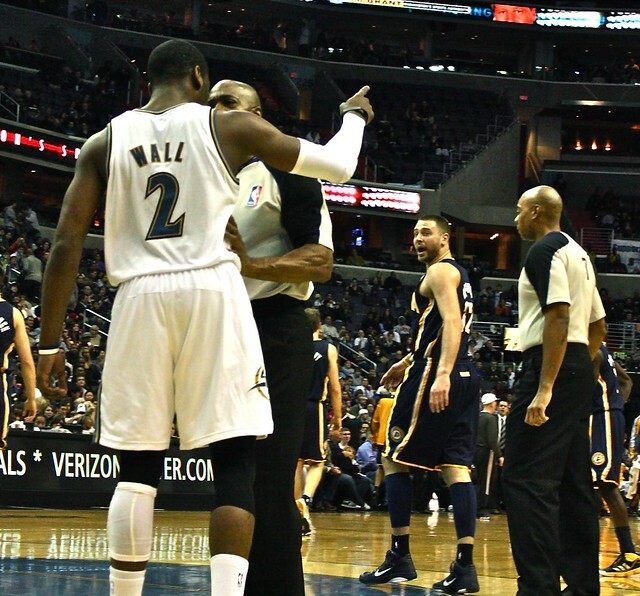 It was late in Wednesday night’s Wizards win over the Indiana Pacers. John Wall had just used his all too familiar quickness to dart past Darren Collison and then shuttle the ball to Nick Young in the far left corner for a three-pointer that put the Wizards up 100-84 with 2:23 left in the game. But in the process, Wall took a hard tumble to the floor — thanks to some Pacer I assumed at the time — I just remember Wall’s reaction. He flipped the referee an incredulous look, searching for a reason why he didn’t blow the whistle. The next thing I knew, after a whistle had blown for another reason on the other end of the court (Andray Blatche fouled Tyler Hansbrough while shooting), Wall was in Josh McRoberts’ face, directly in front of where I sat on the baseline taking photos. Looks like a dirty elbow/forearm to me. Sure, these things happen in the NBA … be a man, be tough, and take it. I suppose that a similar move from someone such as, say, Kevin Garnett, might have been handled differently by Wall … through respect for Garnett on multiple levels. But when it’s a Duke Blue Devil doing dirty deeds to a Kentucky Wildcat? A statement had to be made. Wall didn’t take it sitting down, and he probably shouldn’t have. But he also should learn to keep his emotions in check. What if the Wizards were only up by three points instead of 16? It would have been a different type of game changer. 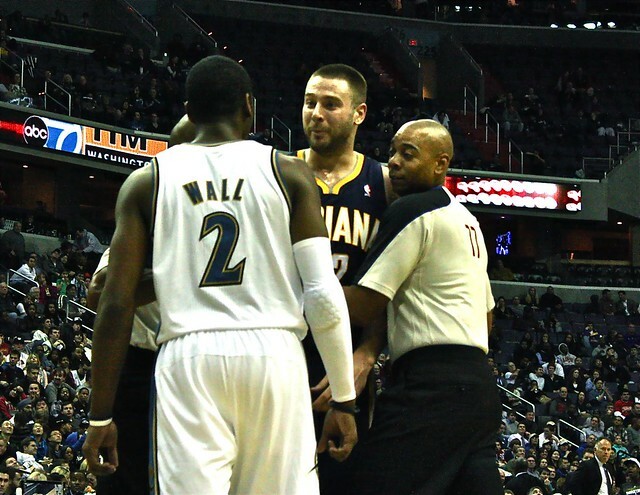 Bigger picture … Wall has heart and emotion, and he’s not going to back down in any regard. And that’s a good thing.